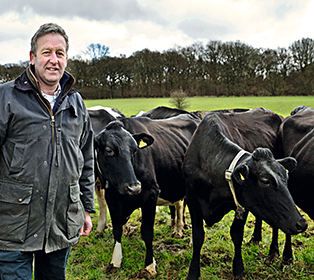 "You can see that they're happy to be out in the fresh air"
Down on David Homer’s farm near Newbury, 220 cows produce essential Waitrose milk, and like all the retailer’s dairy animals, they spend the middle part of the year outside grazing on fresh grass. Bringing the cows outside has wider benefits, too. 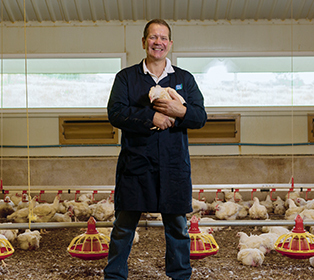 "Happy chickens is what we want"
– Stephen's has been in his family for three generations. They only supply chickens to Waitrose, so we've created a long-term relationship that means the farmers can plan ahead. 'I've been supplying Waitrose for 10 years now,' says Stephen. All the farmers work to strict standards of animal welfare, feeding the hens a cereal-based diet and rearing them in purpose-built houses with large windows to let in plenty of natural light, which encourages the chickens to be alert and active. They also have 20% more space than the industry standard, which has been endorsed by Compassion in World Farming.